Now that another season is over, let's look back at the players and teams that stood out—for better or worse—plus the year's best dunk, block, game and more. The confetti has fallen, "One Shining Moment" has been sung and we're about to say goodbye for good to another season of college basketball. Hoops fans were spoiled this year, between an exciting regular season, one of the best NCAA tournaments ever, the nightly highlights of Zion Williamson and more. But before we fully turn our focus to next season, we looked back on the best and worst of 2018–19—the best dunk, best shot, breakout player, strangest game, most disappointing team and plenty more. All of the honorees are deserving, but we aimed to limit the number of repeat winners. No surprise here. This was the Season of Zion, whether you were a fan of Duke’s freshman phenom or not. Missing six games late in the regular season didn’t slow his campaign to becom only the third freshman ever to be named Naismith Player of the Year, and he gets the nod here as well for being a once-in-a-generation type of college player. We’ll miss you, Zion. Seven months ago, the Red Raiders were chosen seventh in the preseason Big 12 poll, received just six votes in the preseason AP Top 25 and were ranked No. 41 in SI's preseason rankings. A glass-half-full expectation of their season had them contending in the Big 12 and finishing the year ranked, with a Sweet 16 run likely considered their absolute optimal ceiling. You know what happened next. Texas Tech not only got to its first Final Four after winning a share of the Big 12, it came within a basket of cutting down the nets in Minneapolis. Beard deserves endless credit for the job he did this season, whether it’s Jarrett Culver’s development into an NBA lottery pick, landing coveted grad transfers Matt Mooney and Tariq Owens or coaching the nation’s best defense. It’s not that the Terriers weren’t on anyone’s radar—after beating UNC in Chapel Hill in 2017–18, the tiny Spartanburg, S.C., school had made a name for itself—but no one expected Fletcher Magee and his merry band of sharpshooters to be this good. After starting the season ranked 121st on kenpom.com, Wofford rose more than 100 spots over the course of the year, finishing at No. 18. Late in the regular season, it even broke into the AP Top 25 for the first time in school history thanks to its sterling 18–0 mark in a strong Southern Conference. The Terriers deservedly earned a No. 7 seed in the Big Dance, then made good on it by beating Seton Hall in the first round and taking No. 2 seed Kentucky down to the wire. Magee’s unfortunate showing in that game was a bitter way for his college career to end, but the season-long efforts of him, Storm Murphy, Nathan Hoover, Cameron Jackson and their teammates deserve plenty of praise. It’s rare that a No. 4 seed in the NCAA tournament is considered a “disappointment,” but this was a decidedly un-Kansas like season. The Jayhawks were the preseason No. 1 in the AP poll (and on SI) and were thought to be stocked with talent and depth. A myriad of issues—Udoka Azubuike’s season-ending injury, Silvio De Sousa’s suspension, Lagerald Vick’s leave of absence and the inability of freshmen Quentin Grimes and Devon Dotson and transfers K.J. Lawson and Charlie Moore to replace all that Kansas lost in the backcourt—contributed to Bill Self’s team falling short of expectations. It culminated in the program’s record 14-year Big 12 title streak coming to an end and a second-round loss in the Big Dance. It was the clash of the titans everyone expected back in February, before Zion Williamson’s shoe mishap in the first 30 seconds spoiled one of the most anticipated games in the history of the Duke-UNC rivalry. After two Tar Heels wins in the regular season with Williamson sidelined, the stage was set for Duke's potential revenge with a trip to the ACC championship game on the line. The battle delivered, with the rivals combining for 32 fast-break points and 88 points in the paint to make up for poor outside shooting. It came down to the last possession after Williamson tipped in his own miss with 31 seconds remaining to give the Blue Devils a one-point lead. After a Cam Johnson three rimmed out, R.J. Barrett missed two free throws to give UNC a chance to win it, but Nassir Little couldn't tip in Coby White's missed three at the buzzer to seal a thrilling 74–73 Duke win. 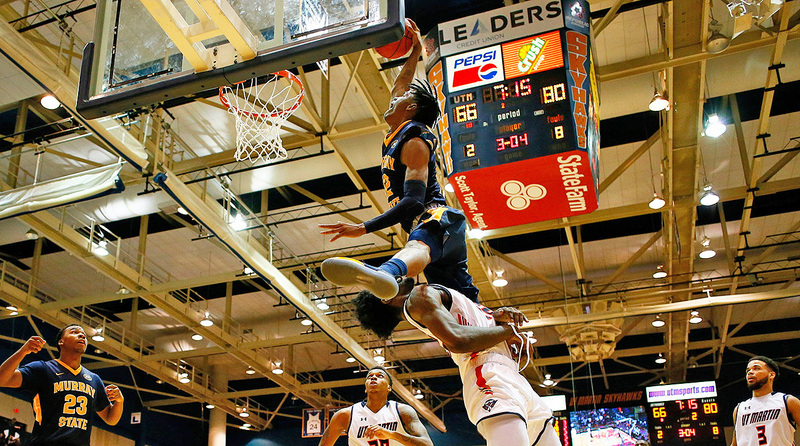 Apologies to Zion, but Ja Morant brought down the house with this dunk, which featured the 6'3" guard leaping over UT-Martin's 6'8" forward Quintin Dove, Vince Carter-style. We’re still trying to figure out how Zion pulled this off. With a healthy Zion back, Duke came into the NCAA tournament looking like the nation's scariest team, but it never lived up to that in its four-game March Madness run. Instead, it trailed No. 16 seed North Dakota State late in the first half, then needed last-second rim-outs by UCF and Virginia Tech just to advance to the Elite Eight. Still, this was the overall No. 1 seed, and this was Duke, and Duke had Zion ... and R.J. Barrett, and Cam Reddish, and Tre Jones, and a host of other former top-100 recruits. After its second straight escape act against the Hokies, it was fair to wonder whether anyone would ever deliver the death blow. We got our answer two days later, when a veteran Michigan State squad did the honors, showing that experience still goes a long way in the one-and-done era. Edwards’s NCAA tournament was the stuff of legends, and he nearly dragged his team to the Final Four because of it. His 42-point outburst against one of the nation’s best defenses (Virginia)—in which the 10 threes he sank seemed to get increasingly (and comically) difficult in measure—will be remembered the most, but his entire tourney effort was stellar. He scored 26 against Old Dominion, 42 against Villanova and 29 against Tennessee as well, making 28 triples along the way and etching his name forever in March lore. Imagine making your program’s first-ever Final Four, and beating bluebloods Kansas, North Carolina and Kentucky to do it. Bruce Pearl and the Tigers don’t have to imagine, because that's exactly what they accomplished this March. Coming into the Big Dance hot off an SEC tournament crown and winners of eight straight, Auburn survived a near-meltdown vs. New Mexico State in round one before reeling off three of the more impressive NCAA tournament wins you’ll ever see in a row. They buried both the No. 4 seed Jayhawks and No. 1 seed Tar Heels with a barrage of threes, then used defense and some timely scoring to take down the No. 2 seed Wildcats. Were it not for a missed double dribble, they may have even kept dancing into the national championship game. Once again, no one in the country proved more capable of getting instantly hot than Marquette’s Markus Howard. The junior has had multiple 50-point games in college, including a career-high 53 this season, but nothing impressed more than his 40-point second half against Buffalo. If you’re keeping score at home, that’s two points per minute (2.1 to be exact, since he played 19). Like many of Howard’s explosions, this one started at the three-point line (where he went an unconscious 8 for 10 in the half), but he also was a perfect 10 for 10 from the charity stripe. Poor Buffalo hardly knew what hit it. We admit there’s not exactly much competition for this award this year. Unless you make a deeper run, it typically takes a No. 13 seed or lower to be considered a first-round Cinderella, and there was exactly one of those in 2019: UC Irvine, which beat No. 4 Kansas State. But the Anteaters are a worthy recipient, having won their first-ever NCAA tournament game in only their second-ever appearance. They got there by rolling through the Big West with a roster full of NBA legacies, and they owned the nation’s best two-point defense this year. The Racers were a popular pick to upset No. 5 seed Marquette, which limped into the Big Dance having lost five of six games, but the expectation was that Markus Howard would at least keep things close. Instead, the Golden Eagles were thoroughly dominated by Ja Morant and Murray State, turning in a brutal offensive performance (37.2% inside the arc, 25.8% from three) in an 83–64 loss. Morant racked up a triple double, while Howard’s 26 points came on 9-for-27 shooting. Murray State getting picked apart by Florida State in the second round didn't help matters. Remember back in November, when the big question about Duke after its opening romp over Kentucky was whether it would ever lose a game? It didn’t take long to get the answer. The Blue Devils met their match in the Maui Invitational final against Gonzaga. In one of the most entertaining games of the year, the two top-five teams went back-and-forth in the intimate Lahaina Civic Center, delivering a Feast Week treat to all those tuning in on the night before Thanksgiving. In the end, it was a series of defensive stands in the final minute that gave Rui Hachimura and the Bulldogs a hard-earned 89–87 win that still stands up as the regular-season’s best. We’re still trying to process how this one happened, to be honest. The Pac-12 was bad this year, yes, but regular-season champ Washington had no business losing this game. The Golden Bears were on the tail end of an absolutely awful season, were 0–15 in conference play, featured one of the worst defenses in Division I and were easily the worst Power 5 team. Yet the Huskies’ usually reliable zone defense let Cal score 1.21 points per possession in a 76–73 defeat, the same number that No. 1 offense Gonzaga had against Washington earlier in the season and tied for the second-most anyone had against UW all year. The season's biggest mystery may be what happened at Haas Pavilion that night. We're going way back to early November for this one. Up by 24 with 12:30 to go in its season opener at Charlotte, Oklahoma State was cruising to its first victory of the year. Kenpom.com's algorithm put the 49ers' win probability at a paltry 0.2% at this point, which may have been generous for a team that would go on to win just eight games all season. Yet, improbably, Charlotte rallied, ripping off a 28–4 run and tying it up on a Jon Davis three with 1:22 remaining. After the Cowboys took a four-point lead back with 30 seconds go, things again looked bleak, and the game turned into a free throw shooting contest ... until Davis, aided by a flagrant foul call, scored five points in the final 4.2 seconds to stun the visiting side, including a banked-in three with 0.6 seconds left to win it. CHARLOTTE BEATS OKLAHOMA STATE ON A GAME-WINNING THREE! Considering how fresh it is, we’re not going to re-hash the Cavaliers’ incredible run from being the first No. 1 seed to lose to a No. 16 seed to coming back and winning the national title the very next year, but we will direct you to Andy Staples’s feature on how they did it. After a 12–20 season in 2017–18, Vanderbilt came into this season with fresh optimism. Bryce Drew had brought in the No. 13 recruiting class, headlined by five-stars Darius Garland and Simi Shittu, and sophomore guard Saben Lee led the returnees. By the end of November, Garland was done with a torn meniscus, suffered in a loss to Kent State. The Commodores would win just five games the rest of the way … and none in 2019. They were one of just four teams nationally (Chicago State, Portland and Tulane) to go winless in conference play, and had the ignominious honor of easily being the most high-profile of those programs. Drew was soon fired, and Jerry Stackhouse brought in. The good news for Stack: It’s hard to do any worse. While there’s no doubting R.J. Barrett’s status as a top NBA prospect, the No. 1 ranked recruit's one year in college often received mixed reviews. His raw numbers were impressive—22.6 points, 7.6 rebounds, 4.3 assists—but his efficiency numbers were good-but-not-amazing (50.6% effective field goal percentage, 53.2% true shooting percentage), and he shot just 30.8% from three and 66.5% at the free throw line. The biggest criticisms of Barrett, however, came from those who felt he was, at times, too selfish on a loaded Duke team. Barrett took 33% of the team’s shots when on the floor (Zion Williamson, for comparison, took 27.7% and Cam Reddish 25.5%, per kenpom), and his late-game decisions to try to be the hero in losses to Gonzaga and Michigan State will continue to stick in fans’ minds. Still, his production was a massive part of the Blue Devils’ 32-win season, even if they ultimately fell short of their goals. White wasn’t expected to be the biggest star freshman for UNC this year—that preseason designation went to top-three recruit Nassir Little—but it didn’t take long to see he would outplay his No. 27 ranking. His coming out party came in Las Vegas on Thanksgiving night, when he scored 33 and made seven threes in a loss to Texas, and he would prove to be a perfect fit to run the Tar Heels’ breakneck offense. White’s dazzling plays became must-see highlights, and his emergence at point guard was invaluable for a UNC team that entered the season with major question marks at the one. Campbell’s 5'9" senior made history this year, averaging 30 points per game on the dot to close out an excellent college career. Clemons became the first player to average at least 30 ppg in 22 seasons, although Central Michigan’s Marcus Keene came within a fraction of the feat himself two years ago. The Fighting Camels fell short in their bid to snap an NCAA tournament drought that dates back to 1993, but they did win their first Big South regular season title and went to the NIT. College basketball will surely miss the super-scorer next year. If there were a “most underappreciated player” award, it would go to Clarke too, as the junior didn’t get nearly enough press for the season he had in Spokane. After sitting out a season following his transfer from San Jose State, Clarke’s 2018–19 Player Efficiency Rating on Sports Reference was higher than any other player in the last 10 seasons—that is, except for Zion Williamson, whom he finished second to this year. He made 70.5% of his 359 two-pointers and had nearly as many blocks (114) as missed shots from the field (117)—which is plainly absurd. Vick’s senior year was an odd one, starting way back with last offseason, when it was believed he would turn pro, and then even potentially transfer after he pulled his name out of the draft. In the end, Vick came back to Lawrence, and played a surprisingly vital role for Kansas, averaging a career-high 14.1 points and shooting a stellar 45.5% from three. But in early February, it was announced that the senior would take a leave of absence for a personal matter, one he did not return from. His final collegiate game wound up being a Feb. 5 loss to Kansas State in which he scored seven points. When Duke was losing by 23 with 10 minutes remaining in its Feb. 12 matchup with Louisville, the situation felt surreal. Don’t forget—this was before Zion got hurt, and the Blue Devils were fresh off their second impressive win over Virginia. They hadn’t lost at full strength since the Gonzaga game in November and were already thought to be a near-lock for the No. 1 overall seed in the NCAA tournament. So it was almost unfathomable that they could be down by more than 20 points, even on the road against a sometimes-dangerous Cardinals team. Then things got even more bizarre: Duke began an unstoppable, inevitable comeback that broke Louisville’s spirit long before Cam Reddish drained a game-tying three with 1:29 to go. It was only fitting that Reddish then won the game in regulation on free throws, sending beat writers everywhere scrambling to rewrite what had just transpired. The Wolverines started the year on fire, dismantling Villanova, Purdue and North Carolina by Dec. 1 to quickly turn into a top national title contender and bring belief that they may be even better than the Michigan team that had just made the national championship game. And while John Beilein’s group was indeed one of the country’s best teams, it wasn’t quite as good as its first month of the season portended—especially on offense. The Wolverines opened the year 17–0 before going 9–5 to end the regular season, then saw rival Michigan State complete a three-game season sweep in the Big Ten tournament final. They eventually bowed out in the Sweet 16 after struggling to score against similarly defensive-minded Texas Tech. Losing four senior starters wasn’t enough to dissuade most people’s preseason optimism for Purdue; the Boilermakers were No. 24 in the preseason AP poll despite a rash of question marks. In the end, voters’ faith in star Carsen Edwards and coach Matt Painter was validated, but not without plenty of bumps in the road. Purdue started the year 6–5, including a brutal seven-game stretch that included five losses. Most of those defeats were understandable (Virginia Tech, at Florida State, at Michigan, at Texas), but a Crossroads Classic loss to Notre Dame—a team that would go on to win three ACC games—was a head-scratcher. It turned out, the young Boilermakers just needed some time. As the supporting cast around Edwards grew, so did Purdue, and it would up being co-regular season champion of a loaded Big Ten. Edwards then turned into a superhero in March and nearly took the Boilers all the way to the Final Four. Rutgers was the laughingstock of the Big Ten in its first four years in the conference, with nine league wins over that span, but no one laughed this year—especially in trips to the RAC. After a 1–6 start to Big Ten play, the Scarlet Knights started to put things together under third-year coach Steve Pikiell, despite playing in the nation’s most competitive conference. They closed the regular season winning six of 13 games, and their seven overall Big Ten wins matched their combined total of the last three years. Those victories included wins over tournament teams Ohio State, Minnesota and Iowa, as well as NIT teams Nebraska and Indiana. With only one rotation player graduating (Shaquille Doorson), sunnier skies finally look to be on the way in Piscataway. The ACC had the top-heavy names (and the eventual champ), but the Big Ten was top-to-bottom the nation’s best this year. Consider that all 14 conference teams finished within the top 85 on kenpom (the ACC had four teams outside of that), and its lowest-ranked one, Illinois, logged wins over Michigan State, Maryland, Ohio State and Minnesota. The Big Ten’s competitiveness gave it a feeling of unpredictability in league play, but it also had an impressive non-conference showing as well. In the tournament, it went 7–1 in the first round, including seed and Vegas upsets over Louisville, Cincinnati and Iowa State, and saw the Spartans later knock out No. 1 overall seed Duke. Here’s the good news for the Pac-12: It at least had a better NCAA tournament showing than it did in 2018, when it didn’t log a single win. This year, Washington and Oregon both won first-round games (the Ducks even made the Sweet 16), while Arizona State picked up a First Four victory over St. John’s. Unfortunately for the Pac-12, little else went right. It had just about as bad a non-conference showing as a Power 5 school can, and its league race was non-competitive (its champion, Washington, won it by three games despite the aforementioned loss to lowly Cal). It was lucky to send three teams to the Big Dance and could’ve very easily sent only the Huskies had a couple things broken differently during Championship Week. Better days do appear to be on the horizon, however. SEC fever swept its way to the hardwood this year, culminating in one of the conference's best collective March Madness showings in years. It made up a quarter of the Sweet 16 (Auburn, Kentucky, LSU and Tennessee) for the first time since 1996 and sent two teams—Auburn and Kentucky—to the Elite Eight, where they faced each other. Success for LSU was no sure thing in the tournament after Will Wade's suspension, and the Wildcats had to overcome a two-game absence of star PJ Washington. Even if the Vols' Sweet 16 exit was a disappointing way for their excellent season to end, they showed their mettle in a stunning comeback to force overtime against Purdue. A down year saw the Big East send just four teams dancing: No. 6 seed Villanova, No. 5 seed Marquette, No. 10 seed Seton Hall and First Four team St. John's. The Wildcats were the only one to win a game, beating No. 11 Saint Mary's before getting run out of the gym by Purdue in the Round of 32. The Golden Eagles were likewise blown out by Murray State, while Seton Hall fell victim to Wofford's three-point barrage and the Red Storm lost a sloppy affair with Arizona State. Expect the league to bounce back next year.